Last week, in the lead-up to the release of a "Long-Term Energy Plan" (LTEP), the government of Ontario posted a new page to the Ministry of Energy's website: emPOWER Me. The page is mainly short video clips, and most are harmless enough. The Value of Conservation is a fine sounding, but very misleading video." "...if you use less electricity you save money on your bill"
Most costs are fixed in Ontario. In fact, if we take away all the nuclear (which has the same operating and financing costs whether the generate or not - and the fuel cost is negligible), the hydro, the wind, the solar, the contracted non-utility generators, the embedded generators and the self-scheduling small generators, we are left with fossil fuel generators that have an annual fuel cost in the range of $400-$500 million. $500 million is a plausible estimate of the maximum annual savings in a market that will likely have charges of just under $12 billion in 2013, up from about $10.25 billion in 2012. The truth is obvious to all followers of the sector; there is no way for Ontarians, collectively, to cut electricity enough to recognize net savings in the face of commodity rate inflation exceeding 16% (this year). "when you conserve electricity at home, less raw material is used for making electricity, and there is less need to build new electricity generation, and less need for new electricity transmission, which requires less distribution to your home." "...you not only save money on your electricity bills, you also save again because there is less need for new electricity infrastructure"
A couple of claims on pages accessed from the emPOWER Me page deserve comment. Your LDC buys your electricity from Ontario’s electricity generators through the Independent Electricity System Operator (IESO), which operates Ontario’s wholesale electricity market. To ensure we always have a steady and reliable supply, a number of electricity generators get contracts to supply power at a fixed price. However, because power is bought and sold on a market where price varies by the hour, sometimes the market price is lower than the contract price. 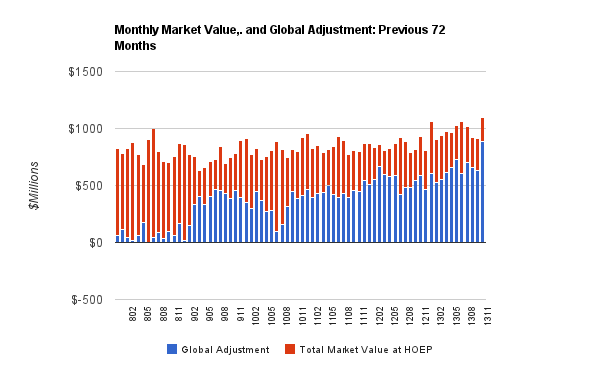 A charge called the Global Adjustment makes up for that gap between prices and covers other related costs of purchasing power. Unless you have a retail contract, the Global Adjustment cost is already built into the price of a kilowatt-hour that you see on your bill. "A number of generators" getting contracts is an understatement. Parker Gallant and I wrote on the damage being done by their non-regulated assets being the only generation exposed to the wholesale market pricing; and those generators appear on the cusp of being guaranteed a much higher rate too. The wholesale market does determine prices for exported generation, and the depressed market rates therefore act as an enormous subsidy of exported power, paid by Ontario's ratepayers. 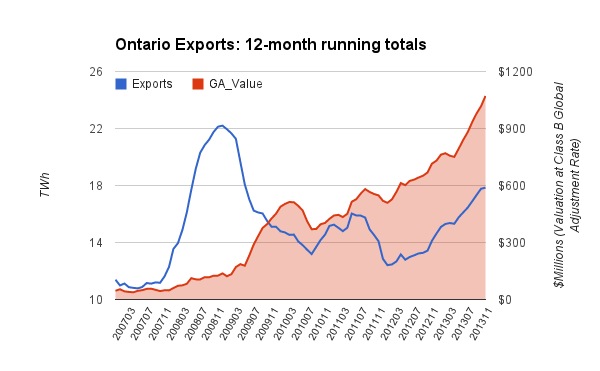 Ways to estimate Ontario's losses on electricity exports discusses different approaches to quantify the cost of exporting. 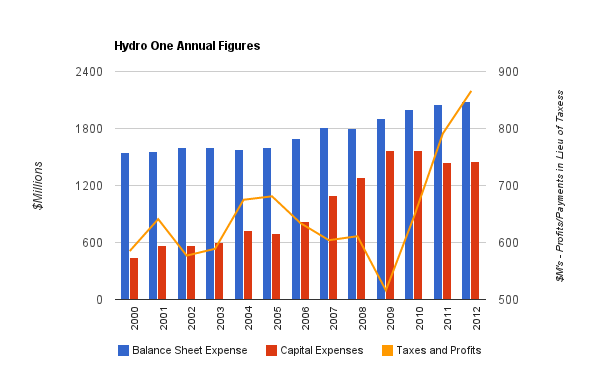 ... is helping pay down the debt of the former Ontario Hydro. 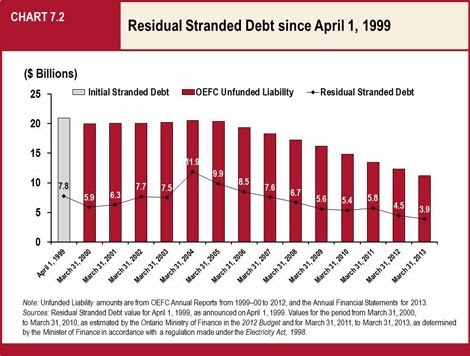 Although the debt was acquired in the past, the electricity generation and transmission infrastructure financed by the debt continue to be used by all Ontario’s electricity consumers. For this reason, today’s customers contribute to paying down the debt through the 0.7¢/kWh Debt Retirement Charge. Since 2003, we've paid off over $5.7 billion and the Ontario Electricity Financial Corporation estimates that the Debt Retirement Charge will likely end by 2018. I have written extensively on the accounting of the stranded debt - most significantly in Stranded Debt, Abandoned Responsibility. “Electricity consumers deserve to know where things stand and how the government is calculating the current ‘residual stranded debt’ balance that they have been paying a special charge to retire,” McCarter said today following the release of the report. It's a farce - particularly as the government left this charge on ratepayers' bills while introducing a larger credit in the comically named Ontario Clean Energy Benefit (OCEB). The OCEB exists because it is associated with the Liberal party. Neither are relevant to a discussion involving energy literacy.